I had a very ripe pear on the counter and remembered my friend telling me about a Korean marinade that used grated fresh pear. I went in search of some recipes online and found this one on Damn Delicious that I couldn’t resist. The marinated meat was so tender and flavorful and it paired nicely with the butter lettuce, rice, and sesame seeds. 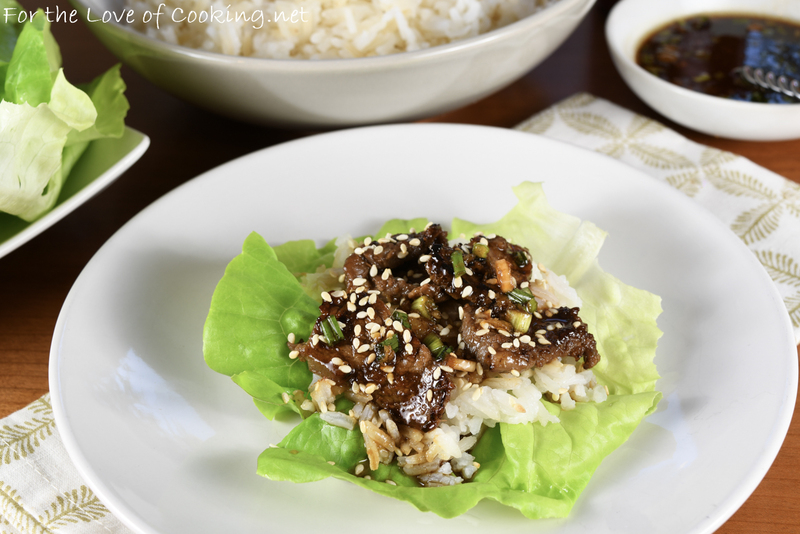 These Korean beef lettuce wraps were a huge hit with all of us and I have a feeling my kids will be requesting this meal again and again. Combine the soy sauce, brown sugar, green onions, sesame oil, grated pear, grated ginger, minced garlic, and sriracha together in a bowl. Whisk the mixture very well then pour 1/3 cup in a separate container; cover and set aside for serving. Add the beef to the marinade in the bowl and toss to coat evenly. Cover and refrigerate for 1-24 hours (I marinated for 5 hours). Remove the meat from the refrigerator 30 minutes prior to cooking. Prepare the rice, per package instructions. Heat a grill pan over medium-high heat. Coat with cooking spray then place some of the beef in the grill pan making sure not to crowd the pan. Cook for 1-2 minutes then flip and cook for an additional 1-2 minutes. Remove from the grill pan and place onto a serving plate and cover loosely with a tin foil tent. Cook the remaining beef. 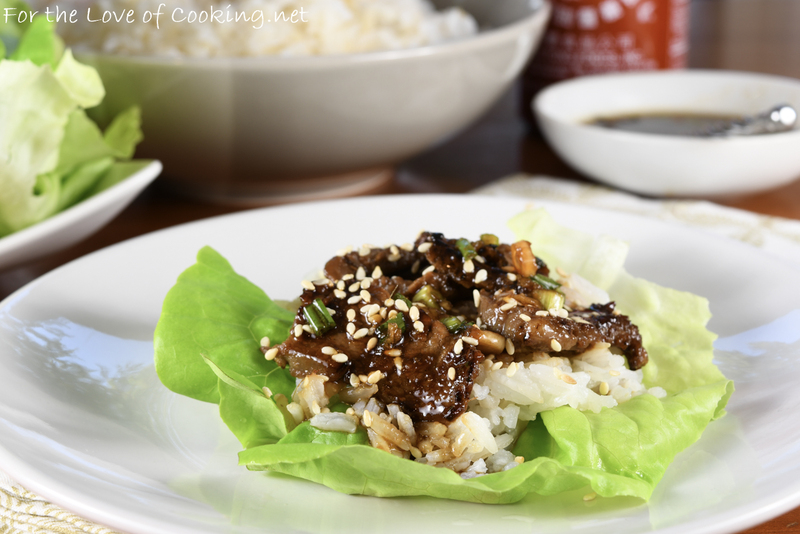 To serve, spoon some rice into the center of the lettuce leaf then top with some beef followed by some toasted sesame seeds. Serve with additional reserved marinade and sriracha, if desired. Enjoy. 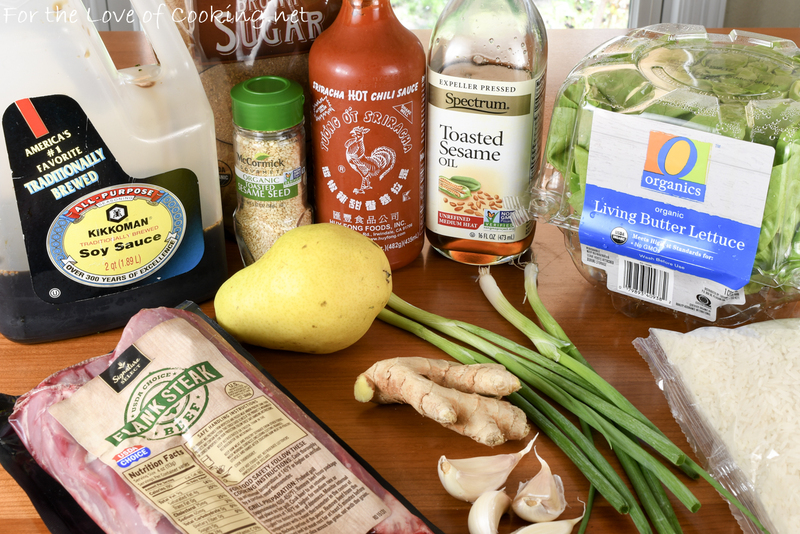 Combine the soy sauce, brown sugar, green onions, sesame oil, grated pear, grated ginger, minced garlic, and sriracha together in a bowl. Whisk the mixture very well then pour 1/3 cup in a separate container; cover and set aside for serving. Add the beef to the marinade in the bowl and toss to coat evenly. Cover and refrigerate for 1-24 hours (I marinated for 5 hours). Remove the meat from the refrigerator 30 minutes prior to cooking. Prepare the rice, per package instructions. Coat with cooking spray then place some of the beef in the grill pan making sure not to crowd the pan. Cook for 1-2 minutes then flip and cook for an additional 1-2 minutes. Remove from the grill pan and place onto a serving plate and cover loosely with a tin foil tent. 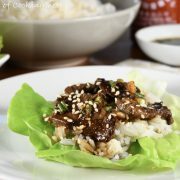 To serve, spoon some rice into the center of the lettuce leaf then top with some beef followed by some toasted sesame seeds. Serve with additional reserved marinade and sriracha, if desired. Enjoy. The lettuce wraps look very DELICIOUS! It looks terrific! I’d need seconds. Wonderful recipe. I love Asian dishes. Love these Asian wraps. Definitely have to try the Korean version. Looks terrific.